We are happy to accommodate your request. Please contact us via our contact form and we’ll usually reply within 24 hours! A solo guest may book a tour with an extra 50% ‘private fee’. If there is no one else on the same tour, the solo guest gets a private tour! If there are other guests on the same tour, please email us after the tour for a refund of this 50% fee. How to Make a Booking? When Should I Book? Please make a booking on this website. We accept all major credit cards. Do NOT walk in. We are NOT at the shop when we are out on tour, or when there are no bookings for that day. We recommend booking early, as soon as your book your flight/hotel. Be assured of our fair cancellation policy (see below). You will receive an automated acknowledgement email immediately. We will then check our tour schedule and reply within 24 hours. If you do not receive anything from us, please check your Junk/Spam folder. Who Can Go? Can I Do It? How about Kids? Anyone who can ride a compact city bicycle (e.g. Bromptons, BikeFridays, Dahon, Tern, etc.). The oldest guest who completed our tour was an 82-year old grandpa! Our pace is relaxed; it’s a sightseeing bike tour, not a race! Which Day Should I Take The Tour? 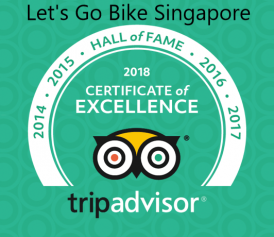 We recommend riding on your 1st or 2nd day in Singapore as we will show you interesting places that you can explore again another day! If you are arriving on a long-haul flight, please ensure sufficient rest before coming on tour. What to Bring? What to Wear? Can I Leave My Bag Somewhere? Bring a CAMERA and some cash. Use a pouch or small bag for your personal items. You can leave luggage or bigger bags in our shop. Think HOT & HUMID SUMMER. Wear a light cotton top and shorts/bermudas, comfortable shoes, sunglasses and sunblock. Bike helmets are provided but you may wear a cap/hat. Jewellery, flip-flops, jeans, dresses, skirts, thick-clothes and valuables are discouraged. Where Is Your Shop? How far from my Hotel? Do You Provide Pickup? No need for a hotel pickup as we are centrally located at Crawford Lane, in the Bugis/Lavender area. If your hotel is in this area, we are 5-15 minute walk away, just ask the concierge to point you the right way! From other hotels in the city, we are 10-20 minute taxi ride away or you can also take the MRT (subway) and walk from Lavender station – walking map may be found under ‘Contact‘ or upon tour signup. Singapore’s public transport is safe and relatively inexpensive compared to major cities. Why Do I Have To Pay First? Can I Pay When I Arrive? Our groups are small, typically 1 guide to 7 guests. With limited bicycles, we accept only bookings with payment. Also, as a fair employer in Singapore, we pay our guides even when guests do not show up. Rest assured with our fair Cancellation Policy – see below. You will receive a full refund if we receive your cancellation notice at least 48 hours before your tour starts. We cycle at a leisurely pace mainly on quiet streets, alleys and pavements, but it is unavoidable that we will ride on the main road for short distances. Each group is accompanied by our Guide who knows the local terrain. You must follow his/her instructions at all times. Typical day temperatures range from 28-33c with high humidity. We will continue cycling in light rain (it’s very nice actually) but will pause for shelter if visibility or safety is compromised. In this case your Guide will bring you to a safe place to rest and wait for the rain to subside (usually 30-45 minutes). Ponchos available upon request. No refunds are given once the ride commences. What if the Tour Can't Even Start due to Rain? In the rare event that the ride cannot even start due to prolonged rain (over 45 minutes), we will refund 50% of tour fee or offer an alternative date. Please note that cancellations/refunds are decided by us. Racing, deviating from route, cycling faster than the Guide, etc. No refunds provided for any of the above. Before departure you must attend a safety briefing and sign an agreement. You MUST follow our Guide’s instructions at all times.